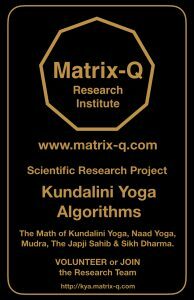 Title: Kundalini Yoga & Sikh Dharma Algorithms. The research project focus on the study of Kundalini Yoga and Sikh Dharma Algorithms. In the mythical history of Sikh Dharma, the original teacher, travel and gathered knowledge from the traditions, cultures and civilizations he perceived as more wise and advanced. The history of Sikh Dharma and Kundalini Yoga, its origin and unfolding, brings together knowledge and history of Eurasia. Principles and methods, natures inspired knowledge, and mostly a technical study of the human phenomena, the human algorithm. As many other traditions and cultures studied by the researcher, through the 3-Fold Comparative study on Traces of the Primordial Culture on modern and ancient times, Kundalini Yoga and Sikh Dharma focus on the Human Algorithm, the Human Phenomena, its potential, its possible development. In the search of traces of the Primordial Culture, along the multidisciplinary explorations and expeditions by the researcher since 1996, the research Project on Kundalini Yoga and Sikh Dharma Algorithms may bring light on several connecting points, principles, and knowledge, that existed in ancient times (and still being observed in modern times) that had great value and hat may be eventually confirmed to be knowledge and technology of the Primordial (proto) Culture. The study on the impact of the destruction of the Alexandria library for our modern times scientific research, suggests that any trace of the ancient knowledge available in its pure form, may be essential for a mayor discovery, reproduction, simulation, identification, perception, study of the Primordial Culture. Reverse engineering, simulations, big data analysis, artificial intelligence based applications would help for the reconstruction of the primordial culture in a simulated virtual environment, and in experiential explorations provided at locations or through processes in which the knowledge and technology of the Primordial Culture would be shared with scientists and innovators. If the researcher is right in his hypothesis, the Primordial Culture is still influencing our time, in particular the process of definition of the principles and values, characteristics of the modern global culture and behavior, perception, emotions and values of its citizens, of the technology being developed and the global civilization emerging. References to the core original knowledge learned and shared by the masters of the Sikh Dharma and Kundalini Yoga, will be as well reviewed, as others not included or related to their approach or vision, as suggested in the graphic presentation of the project “Traces of the Primordial Culture in Modern and Ancient Times” at the Matrix-Q Research Magazine. The experiential study of the knowledge achieved, or identified through the research project, thanks to the PTƟ Primordial Mathematics, geometrical values and patterns, can be translated into principles and practices, that can be experienced, shared, as is the case of the algorithms described for Prime Do, the Path of the Primordial Hero and the 9 Primordial Arts; both of them systems utilized by the researcher for the purpose of exploration on the Primordial Human Algorithm. Why Kundalini Yoga and Sikh Dharma ? As in many other cultures, traditions, practices, that deal with the human phenomena, and observe nature laws, principles, cycles and rhythms, the customs, practices, statements, judgement of value, emotions, perceptions, behavior and decision making principles, chosen are mostly described through a precise set of instructions. In several of these objects of study, a technical system is being provided to the practitioners or students of them (modern times) or to the member of their cities, communities, cultures, clusters or families (ancient times, for example at locations in persia, rome, greek, esparta, tibet, india, japan, china…). The technical description of them may be or not easier to approach, and translated through PSL.2018, into PTƟ Primordial Mathematics, there for described by geometrical values and patterns. The researcher has studied since 1990 a variety of sources, easter and western, and at this point in time considers Kundalini Yoga and Sikh Dharma to offer to him the possibility to reach a new milestone of knowledge and results, verification of hypothesis and validation of theories. 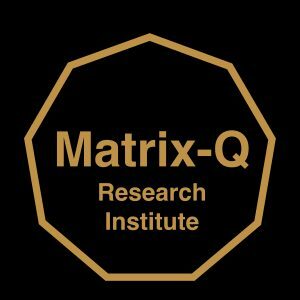 By utilizing Matrix-Q Tools and methods for research (as suggested in the presentation of the project “Traces of the Primordial Culture”) complete sources of knowledge and technology of ancient cultures and civilizations, could be translated. A life time or the use of highly advanced technology capable of big data analysis and data generation, would be necessary. The researcher is working on the development of nonary computing based A.I., which utilizes PSL as A.I. programming language. The completion of this research project may bring unique advanced results to this research project. The researcher consider that for the purpose of achieving more precision and understanding on how PSL and PTƟ Primordial Mathematics can be utilized in order to enhance the results obtained by utilizing Matrix-Q Tools and methods for research, it would be necessary to focus on some specific topics, on each tradition, or source of knowledge (nature inspired ancient cultures and civilizations) that are remarkable, sign and essence of their core knowledge. Starting by the most essential and foundation practices, perceptions and customers suggested by the sources of knowledge, objects of study.